I worked on each mini block one at a time, only getting the fabrics out for each part so that chaos was contained. I have made all the sky sections in advance for each part as it was easier to do that when I had the low volume fabric out. I am not over analysing my choices. 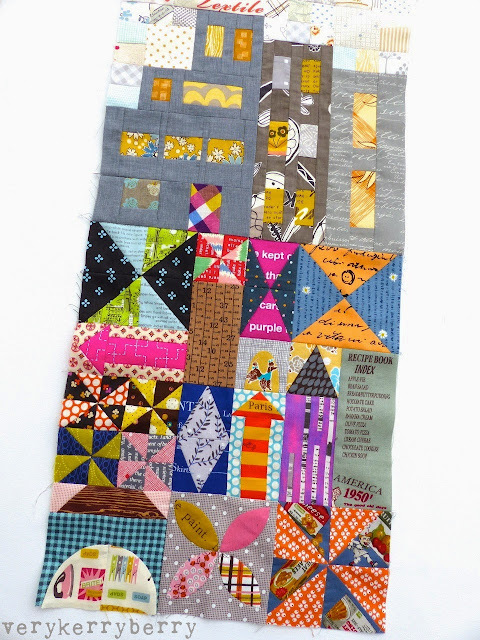 I go with my instinct, create mini narratives within blocks and sew them all together. The only thing I am mindful of is maintaining a medium level of contrast. 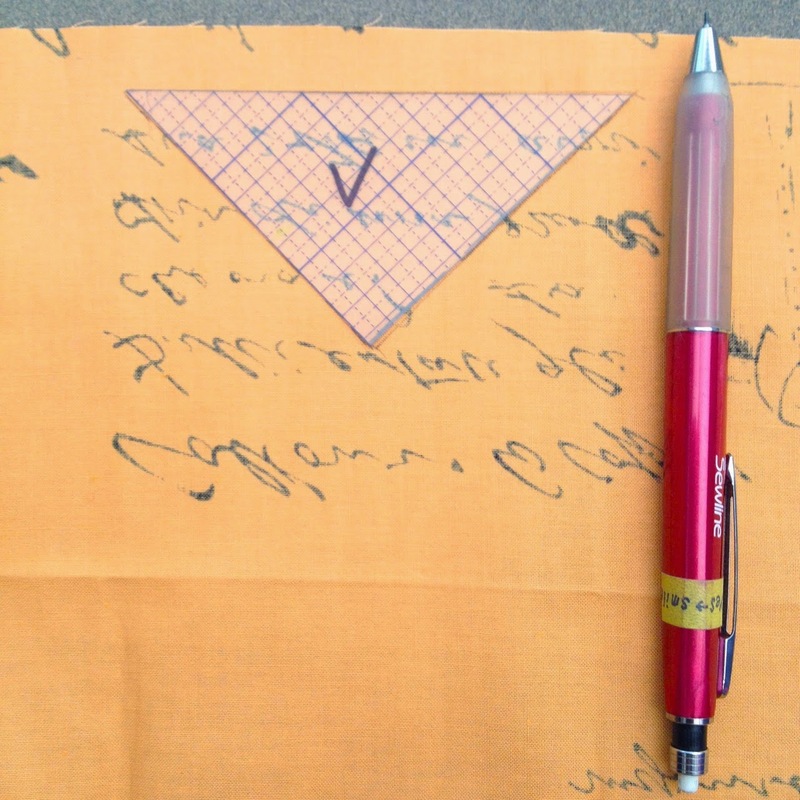 I am using the templates throughout and piecing on my vintage Bernina. She sews a very accurate scant ¼" seam and for such small pieces, that really helps! 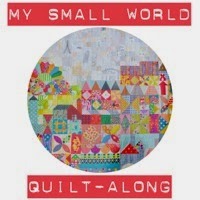 Katy of The Littlest Thistle is super-sizing her My Small World quilt. 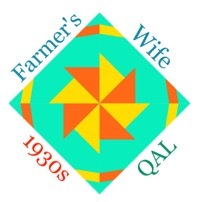 I recommend you read a detailed account of how she's doing it here, plus her thorough reading of the pattern has uncovered more errata and Quiltmania have posted all correction details here. **Edited to add, in Part 1 diagram 5- the instructions and diagrams do not match for Q rectangles and R strips- change the diagram labels- Q becomes R and R becomes Q then they match the written cutting instructions**. I've had a few questions about templates so here is a blog version of some quick guidelines I posted on Instagram and some helpful links. All the templates in the magazine are finished size and do not include seam allowances. 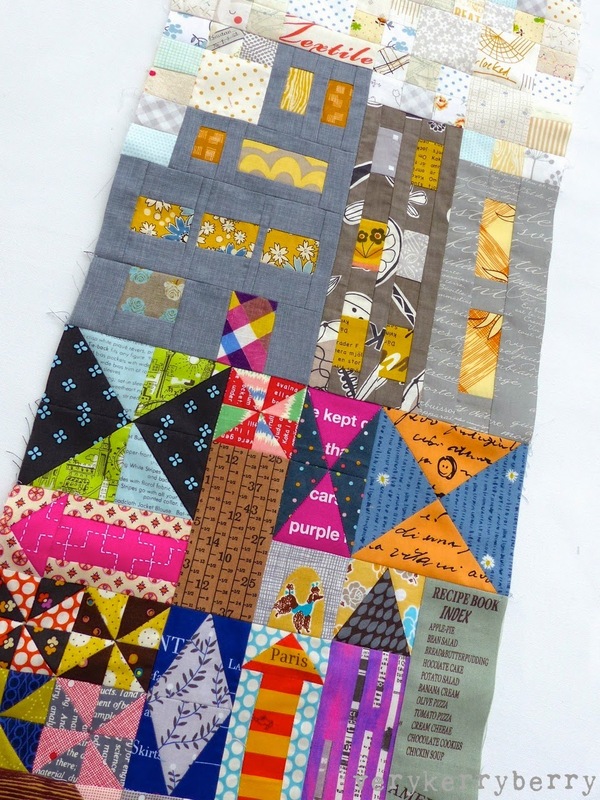 Do also refer to Quiltmania's corrections which include some template labels. 1. Trace the templates onto template plastic and cut out. 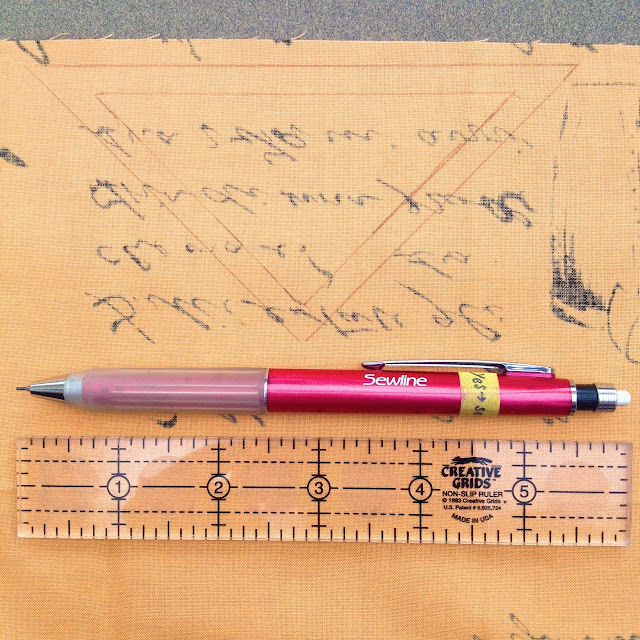 I use a Sewline ceramic pencil as it draw easily on the plastic. If you prefer you can scan or photocopy the templates on to paper, back with card and cut out but these will not be as resilient as template plastic and can distort as they get drawn around. 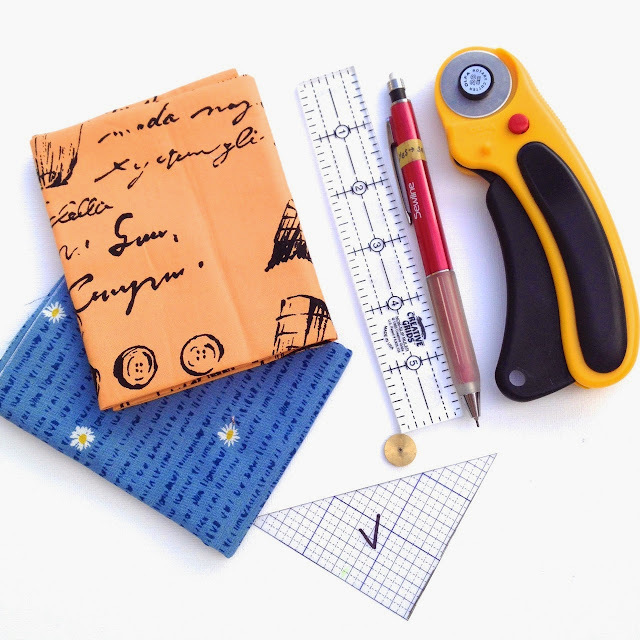 In the picture below, you can see a mini quilter's ruler, Sewline pencil, 28mm rotary cutter, quilter's wheel and a template cut out of template plastic. 2. To use the template, place on the reverse of fabric and draw carefully around with a pencil- I use the Sewline pencil again. This line will be your seam line. 3. 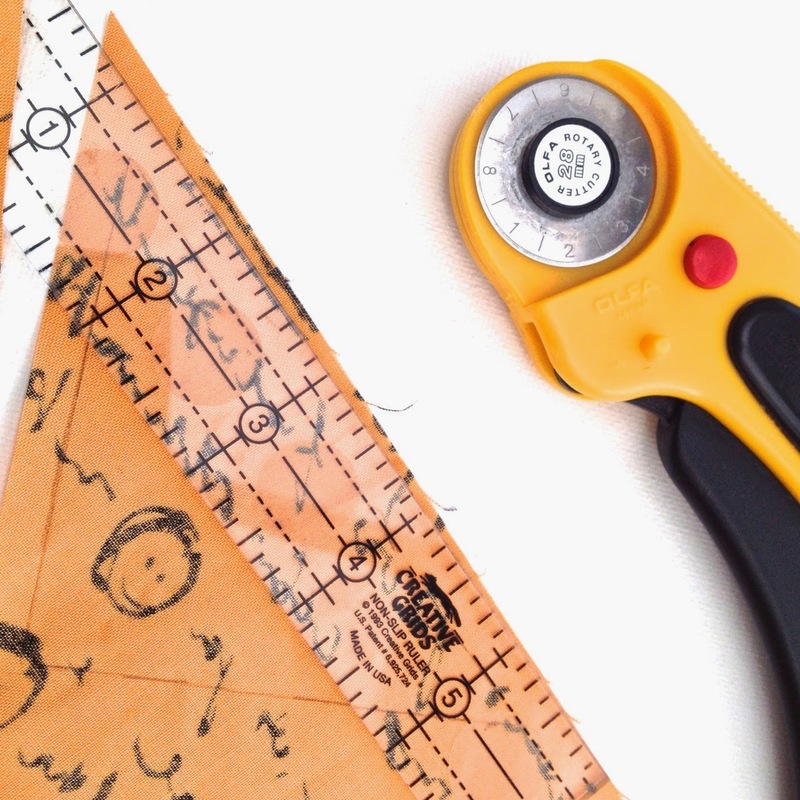 You can either add the seam allowance with ruler and pencil as a ¼" border around the shape, or use a rotary cutter and a quilt ruler or an add-a-quarter ruler and cut out the shape adding the ¼" border all round the shape. Justine at Simply Solids just sent me one of these and I really wonder what I have been doing without one- I'll review it in detail later in the week but I've already heard how many people have one of these on Instagram and everyone loves them. Now I can see why! For curves or circles, a quilter's wheel is a great little tool and it works on straight lines too. It is a little brass disc with a hole large enough to insert a pencil lead. The disc edge rotates rests agains the template edge and with your pencil lead in the hole, the disc rotates around the shape creating the ¼" border. You can then cut out with scissors. There are lots of different approaches to templates, this is how I do mine. Helen of Archie the Wonder Dog sent me a link to a great and highly detailed post at Linda Franz's blog on templates and freezer paper. It is well worth a read as there are a plethora of excellent tips and these are some of the best I have read on the subject. If you can, visit the hashtag on Instagram #mysmallqal. 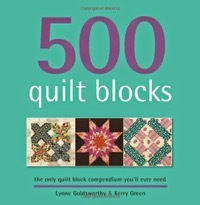 I love the different approaches coming through the picture feed and the help and advice being offered by other quilt-along sewers. It is a truly inspiring community. Jen has designed an amazing and at times challenging pattern with skills that may take you out of your comfort zone but what a quilt to learn on! Thanks Kerry, this is a great post! Love your first part of the quilt! Gorgeous Kerry! I keep wanting to get back to mine. A sure sign of a good project. Love your first section, and thanks to your tip on the quilter's wheel the other day, I've been happily whizzing round all my curved templates adding my seam allowance, thanks for the heads up! One of the benefits of being a late starter in a project like this is that all the pattern errata are found before starting so hopefully it will be smooth sailing for me. I've already ordered a quilter's wheel, I have seen them before but didn't really think I would need one, but I can see that marking curves will be a cinch now. Good tip to make the sky sections in advance, yours are looking beautiful. I have gathered my fabric but in a way I'm kind of glad I'm just getting started. There are many beautiful pictures and it has helped my decisions on some fabric choices. Your section 1 is beautiful! Yours is looking awesome Kerry! I love your first section! What a great quilt and hopefully it's not too late to join in. As debra said she'll catch up as I will. I'll try to find the magazine which will be probably impossible but I'll certainly try. Wish me luck.